The photos of this Great Crested Flycatcher (GCFL) family (except for the eggs) are by Richard Hodder and Betsy Marie of Orlando, FL. This shot was taken with a Luminex Z30. This nestbox is mounted 5.5 feet off the ground. Floor dimensions are 8.5 x 8". The structure on top is a nestbox cam. This female (named Audrey) has returned to this box for four years in a row, raising a brood of five each time. 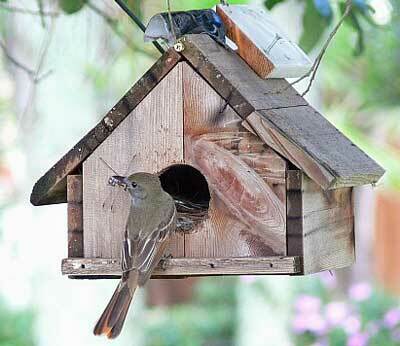 For more information about Great Crested and Ash-Throated Flycatchers in nestboxes, click here. Photo by Richard Harlow of Milton, VT. This nest was just a mass of material. 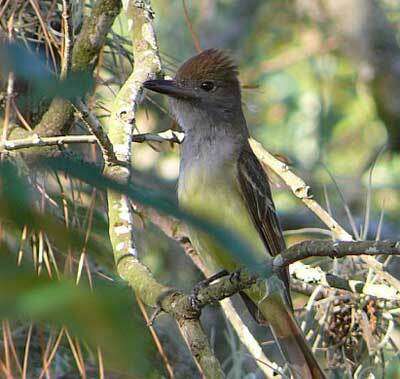 Not all messy nests are from rodents!The flycatcher nested in the back right corner completely covered with debris. 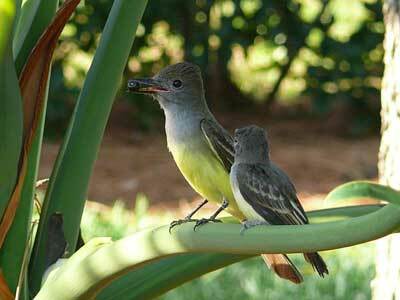 See Flycatcher biology and nesting info. 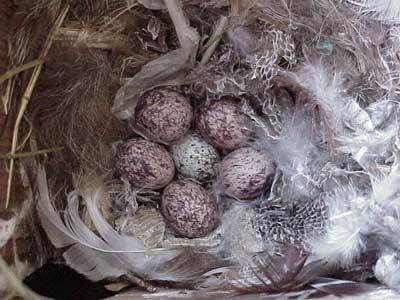 Great Crested Flycatcher eggs. Photo by Keith Kridler of TX. Notice snake skin and cellophane. Eggs usually hatch over a 1-2 day period. The white and brown egg in center is from a Cowbird. Nest Description: Bulky nest constructed of twigs, leaf litter, pine needles, bark, moss, lichen, grass, and rootlets, usually about 10-18" high (most are 12-15"). Off to one side a cup is lined with finer hair, feathers or fur. A piece of snakeskin or cellophane is often found in the nest. Eggs (larger than a HOSP egg), moderately glossy, ivory/cream/pink, and densely streaked/scrawled with fine purple, gray, red, brown, or olive markings often concentrated on the larger end of the egg. GCFL babies hatching. Only two of the three eggs hatched. 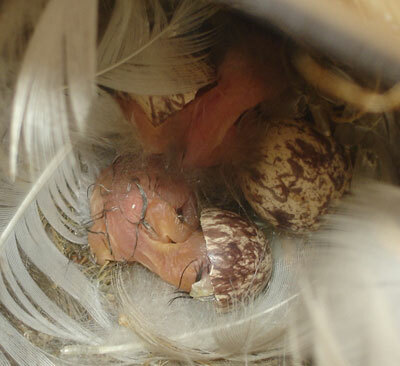 The female left the unhatched eggs egg in the nest. Photo (taken in a mechanics mirror) by P. Sharrar of FL. "Audrey's" babies. Photo by Betsy Marie. 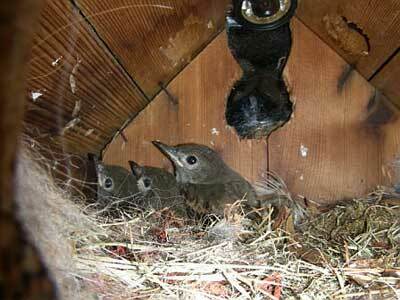 There are actually five nestlings in the box. When the camera came close, they all huddled down and flattened out. GCFL incubation lasts 13-15 days, starting when the next to last egg is laid. These nestlings are 16 days old. This was the day they fledged. Photo by Betsy Marie. 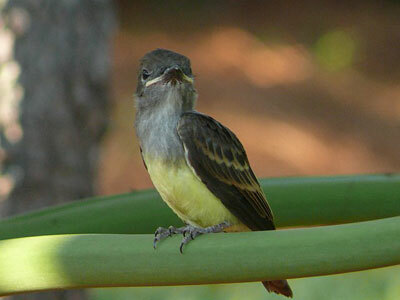 GCFLs usually fledge 14-21 days (13-15 may be typical) after hatching. 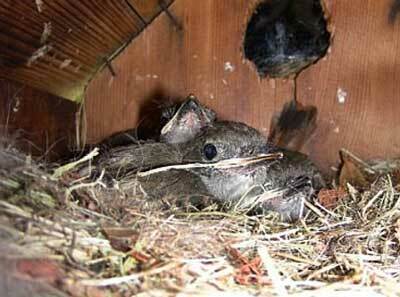 They may stay in the nest longer when food is limited. 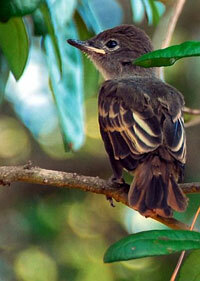 GCFL fledgling. Photo Betsy Marie, on June 5, 2007. This bird is 16 days old. Betsy observed that each time a baby would fly out, the rest would scoot back far into the box, hesitant and frightened. The mother called to the young to encourage them to leave the nestbox, as if she were saying "Come out...you can do it...I'm here, just fly with me." Fledgling. Photo by Richard Hodder. This male (Alec) was the first to leave the nest. He was also the first to open his eyes, flap his wings and peek out of the entrance hole. He was the largest of the brood. The difference in size and maturity can be related to the fact that GCFLs start incubating on the penultimate (next to last) egg. This is the second baby to leave the nest (Alexander). Photo by Richard Hodder. The family stays together for about three weeks after fledging. Mother and child. Photo by Richard Hodder. Audrey picked up the berry (from an unknown tree) from the sidewalk and delicately fed it to her son Alexander before they both flew off. This picture brings the beauty of life full circle. From meticulously building the nest, to laying eggs, to hatching and feeding, and first flight, Audrey and her son have faced the world together. This is Betsy Marie's favorite photo. Adult GCFL. Photo by Richard Hodder. Audrey stayed close by the entire time the babies were fledging. While the camera was clicking, she shrugged her magnificent crest up. Note from Bet: Some people think they need a huge trail before what they do "counts." Never underestimate the power of a backyard birder! Citizen scientists with even one box can get unusual birds nesting, can observe the nesting process more closely, have better photo opportunities, and get the rare chance to witness fledging. 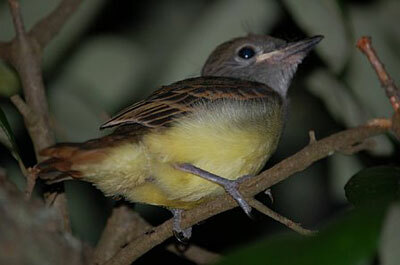 GCFLs are very secretive birds, but this female has become accustomed to and trusting of her landlord's presence. I believe that backyard birders who are respectful but good observers, and those with nestcams will bring our knowledge of cavity nesters to a whole new level. 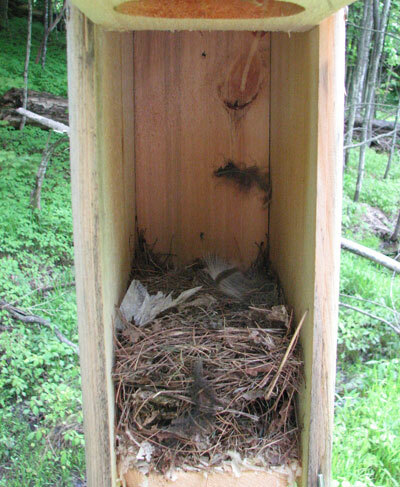 A homeowner will take better care of bluebirds in a backyard box than a trail manager ever could.